In an era of racial prejudice, this monument made history by honoring one of the first African American regiments to fight in the Civil War. On the morning of May 28, 1863, the first Northern corps of African American soldiers marched proudly through the streets of downtown Boston. They were cheered on by throngs of well-wishers who had gathered to see them off to the battlefields of the South. Just five months earlier, the Emancipation Proclamation had opened the doors of military service to black men. And just a few weeks earlier, the Confederate Congress had issued a stern warning: an official resolution stating that every black soldier captured in battle would be sold into slavery and every white officer in their command executed. Still, the Fifty-fourth Massachusetts Volunteer Infantry marched. William Lloyd Garrison, one of American history’s most celebrated abolitionists, was among those cheering them on. So, too, was Frederick Douglass, who had recruited several African American men to the regiment, including two of his own sons. To many in the assembled crowd, the Fifty-fourth embodied the hope of a future country where black men could enjoy the dignity so long denied them. 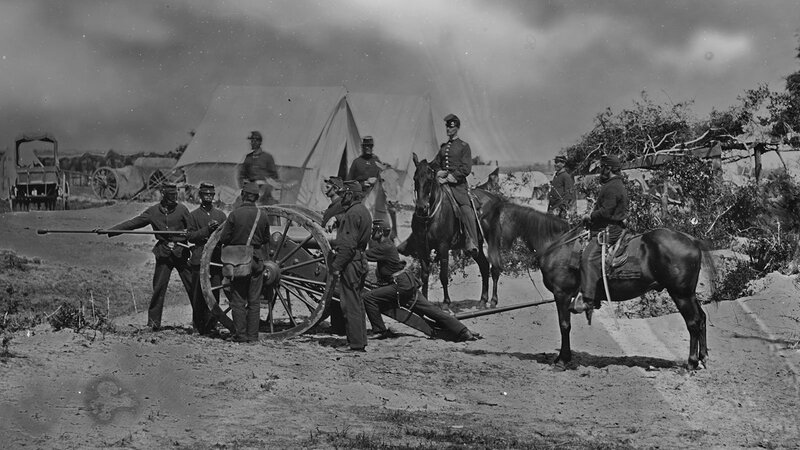 This was an opportunity not only to take up arms in the fight against slavery and its most fervent supporters, but to prove their mettle as soldiers and as men. Still, some white Northerners were still unsure whether black men could be as disciplined and effective as their white counterparts. 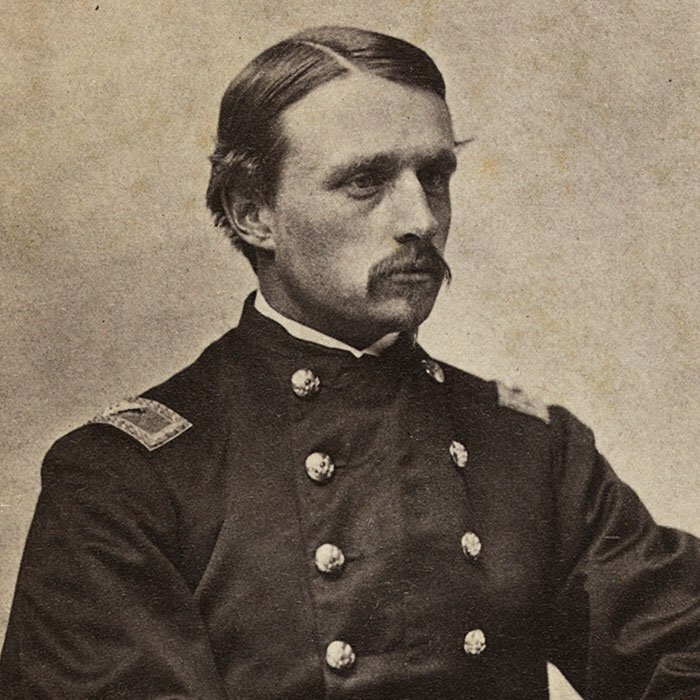 Colonel Robert Gould Shaw, the 25-year-old white man leading the Fifty-fourth, harbored his own racist fears. At first, Shaw declined the appointment. 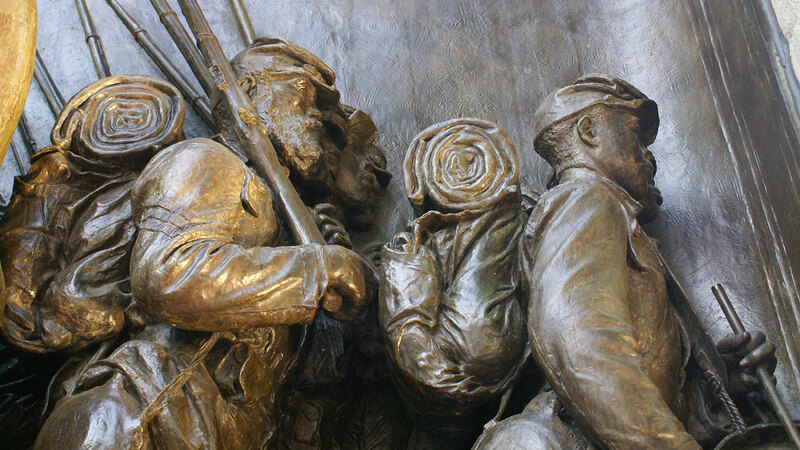 “Shaw…questioned the wisdom of having African American soldiers fight in the Civil War,” said Judith Dupré, author of Monuments: America’s History in Art and Memory. But he eventually accepted the position at the urging of his mother, a staunch abolitionist. 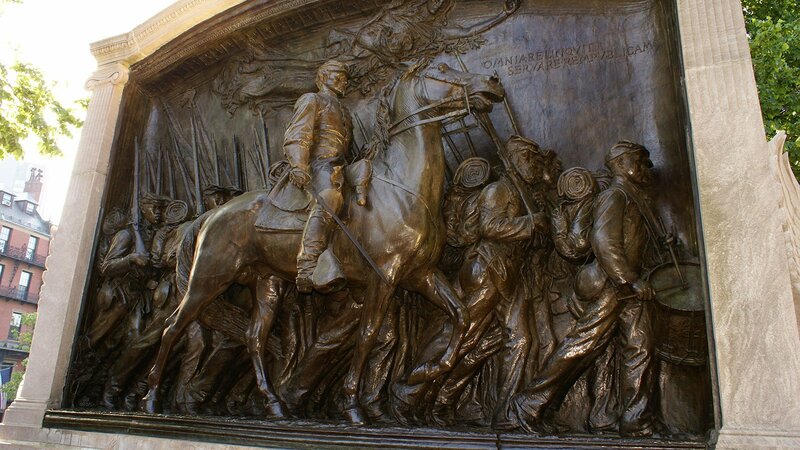 So it came to be that on this morning, Shaw rode his horse down the streets of Boston, leading the way for 1,007 black soldiers, all handsomely dressed in their clean, new uniforms and marching in step behind him. As Shaw rode by his family home, he raised and kissed his sword in a salute to his parents, his sister, and his new bride, whom he had married less than a month before. Later that day, he and his troops boarded a steamship bound for Charleston, South Carolina. Many of them would never return. The Fifty-fourth Regiment had a legendary tour. Among its ranks was William H. Carney, who became the first black soldier to be awarded the U.S. Medal of Honor. Shaw, according to reports from survivors, soon developed a deep respect for his men. 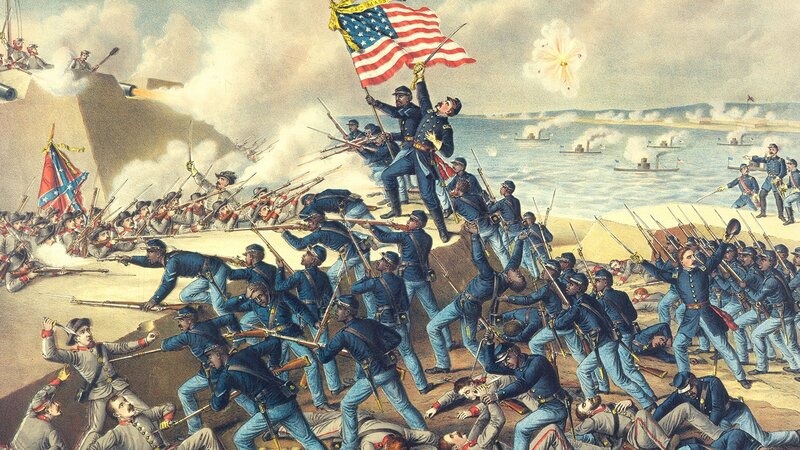 The regiment saw its bloodiest battle in July 1863, when it stormed Fort Wagner on Morris Island, South Carolina, just outside of Charlestown. Nearly 50 of the men from the Fifty-fourth died in that battle, and many more were wounded or captured. Colonel Shaw was among the fallen. To show contempt for the white officer who had led black troops into South Carolina, Confederate General Johnson Hagood refused to return the colonel’s body to the Union army, instead ordering his men to bury him in a mass grave with his troops. But his family was undaunted. Later, when the Union army offered to remove Col. Shaw’s remains and provide him with a proper burial, they refused the offer. “We can imagine no holier place than that in which he lies,” his father said. 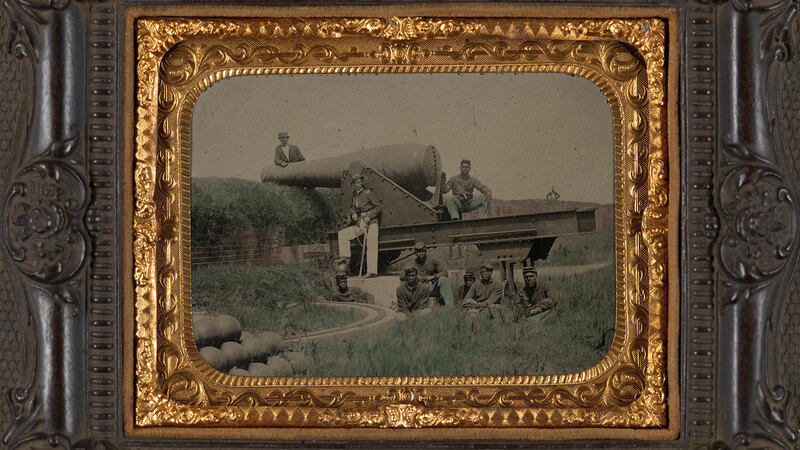 As word of the siege of Fort Wagner spread, the Fifty-fourth became a symbol of bravery, dignity, and patriotism. Soon an effort arose to commemorate and honor the story of the men and their sacrifice. Soon after the war, the survivors proposed a memorial to Shaw near Fort Wagner and their fellow soldiers’ burial site. But due to local opposition, that memorial was never built. The funds raised as part of that effort went instead to create the first free school in Charleston for African American children; the school was named for Shaw. Joshua B. Smith, a black businessman, former slave, and former employee of the Shaw family, initiated a second campaign. It wasn’t until 1883 that enough funds were raised to hire a sculptor. 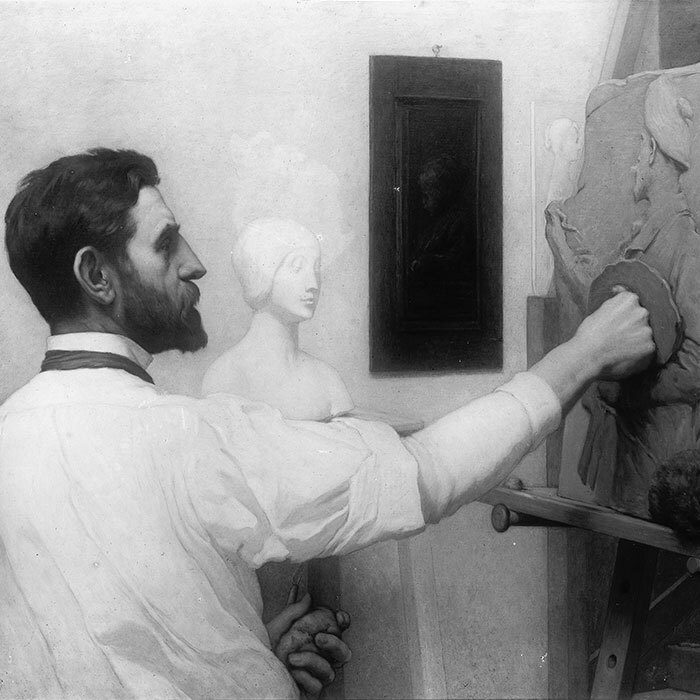 Renowned American sculptor Augustus Saint-Gaudens took the job, but the process took him another decade. Saint-Gaudens’s initial sketches, which were modeled after a famous painting of Napoleon on a horse, put the white colonel front and center and were harshly criticized by Shaw’s family. His final design gave the troops greater prominence and humanity. However, he stopped short of giving them their true identities. 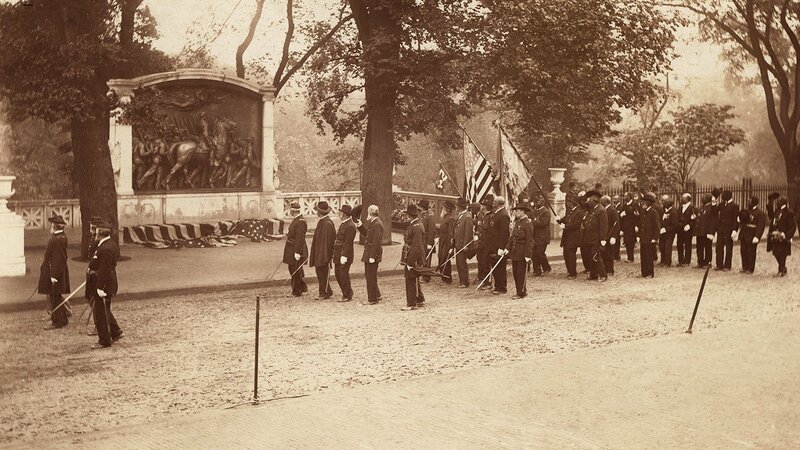 Although there were several photos available of the actual soldiers of the Fifty-fourth, Saint-Gaudens recruited African American men from the streets outside his New York studio to serve as models for the monument. Still, in an era rife with racist stereotypes, Saint-Gaudens’s monument was revolutionary – not just for whom it honored, but how. The prominence and humanity of the black troops was a radical departure from contemporary depictions of African Americans. They were all depicted as individuals, not the stereotypical caricatures that were common at the time. The memorial became extremely important for African Americans throughout the U.S., particularly those who had made their own sacrifices during the war. 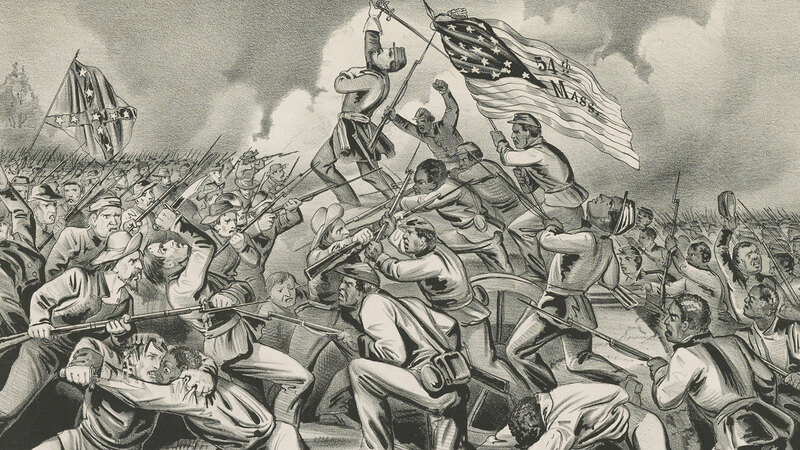 The Fifty-fourth Regiment was one of the first units of African American soldiers, but it was not the last. 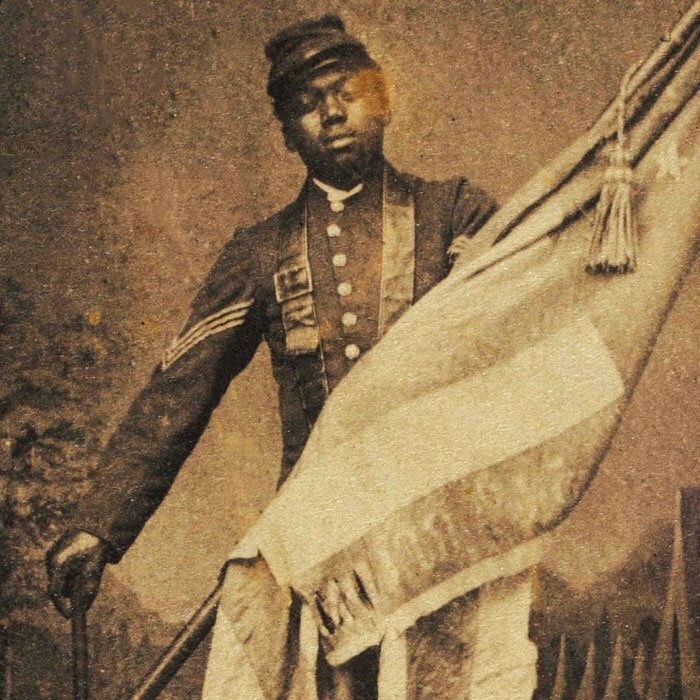 By the end of the Civil War, nearly 179,000 black men served as soldiers in the Union army, making a crucial contribution to the North’s ultimate victory. The monument was finally unveiled on May 31, 1897. 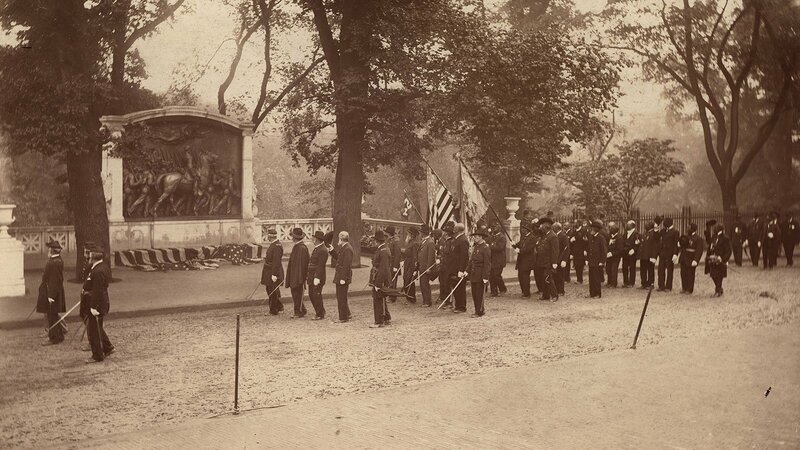 It depicts the men of the Fifty-fourth Regiment marching proudly down Boston’s Beacon Street and stands where they once passed the State House on their way to South Carolina. Many of them were bent and crippled, many with white heads, some with bouquets...The impression of those old soldiers, passing the very spot where they left for the war so many years before, thrills me even as I write these words. They faced and saluted the relief, with the music playing ‘John Brown's Body’….They seemed as if returning from the war, the troops of bronze marching in the opposite direction, the direction in which they had left for the front, and the young men there represented now showing these veterans the vigor and hope of youth. It was a consecration.